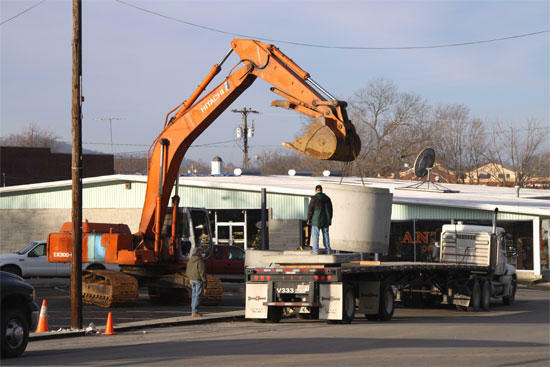 Man and machinery moved into downtown Woodbury early Tuesday morning to begin work on the Cannon County Courthouse Square Revitalization Project. The Courthouse Square Revitalization Project includes the installation of new drainage pipes around the square, the construction of new sidewalks around the perimeter of the courthouse parking lot, wide enough to make them handicap accessible, and new sidewalks around the perimeter of the yard of the courthouse. Work is expected to take approximately four months. During that time, certain areas of the Square will be unavailable for traffic and parking.